A sleek option for flexible light control. Vertical Blinds are one of the most functional window treatments which add modern lines and gentle flow in your space. With Vertical Blinds installed, you can enjoy total light and privacy control at an affordable price. Vertical blinds are low maintenance, easy to clean, practically-priced, and kid proof. The sturdy vinyl and hypoallergenic fabrics are mould-resistant and hypoallergenic. Vertical blinds are best on large windows, sliding/patio doors. Sheer verticals provide privacy in full sun and clear views. Translucent verticals keep out the sun while allowing a clear view. Blackout verticals provides privacy and excellent insulation. While with a vertical blind you will never get complete blackout, you can stop the sun from pouring through, reduce the glare and protect your furniture from UV rays. Vertical blinds give you excellent control of the light entering your home as they allow light to enter in a different way than horizontal blinds or curtains. Each panel of fabric can tilt on an angle to reveal or hide the world outside, providing you with complete privacy and light control. Vertical blinds work exceptionally well on French doors and sliding doors because they can be pulled to either side like curtains or drawn all to one side. They’re a cost-efficient way of covering a large space, and they look modern and stylish too! For added style and energy efficiency, the vertical can be equipped with a pelmet or matched to coordinate with your home’s decor. Functionality aside, there are also hundreds of colours to choose from in a huge range of different fabrics. 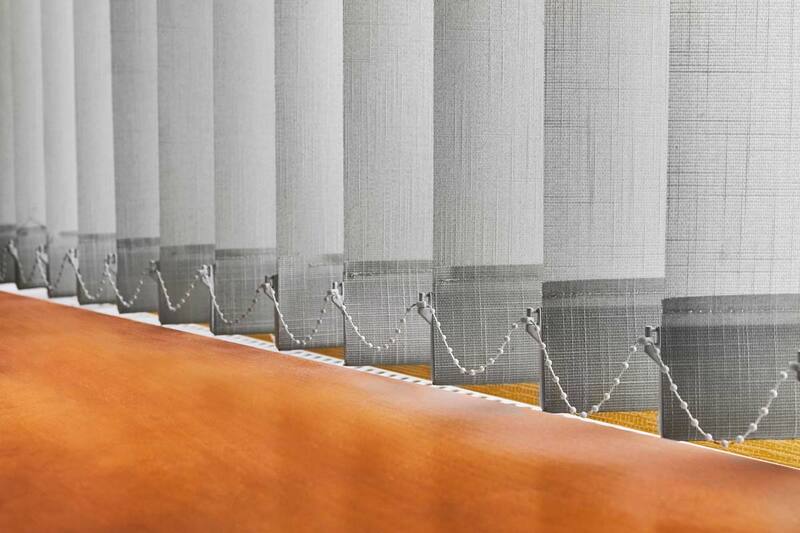 Though vertical blinds of the past tended to bend and twist over time, newer versions are weighted at the bottom to ensure the blades remain straight. Vision Decor’s vertical blinds are made of a vinyl that is mould resistant and hypoallergenic. All our blinds are easily removable for convenient window cleaning. They can be dusted and vacuumed, and the sturdy vinyl is spray and wipeable. They can be washed with a sponge and soapy water, however, is best to refer to the care instructions for your specific blinds. Whether you are building, renovating or just looking to update your space with Vertical Blinds, Vision Decor will educate you with a complimentary consultation in our showroom.